Are You Ready to Turbo Charge Your Disinfection? Have one of our knowledgeable Sales Professionals contact you to get started today. Additional Travel cost will apply if you are outside our travel area. If you have any questions please contact us and we will be able to help. A. Ozone is a chemical known as O³ and is produced, in nature, from lightning bolts during electrical storms (it’s clean, fresh scent is often noticed after a heavy rain) and by ultra violet rays from the sun . When these rays enter earth’s atmosphere, the oxygen in the upper atmosphere is converted into ozone. This is how earth’s ozone layer is created. The special ultra violet rays of the sun are simply duplicated using special ultra violet lamps. When air is passed by these lamps, the oxygen is converted into ozone. Ozone is a form of oxygen also known as “active oxygen”. It is a natural purifier, created by combining three oxygen atoms and is a strong cleaning, purification and oxidizing agent. As it reacts with organics it oxidizes unpleasant odors, kills germs, bacteria and viruses. Q. How does Ozone get into Spa water? A. An Ozonator for Spas is basically a UV bulb inside a small metal box. The box sits inside the Spa cabinet and electrically plugs into to the Spa pack for power. Typically newer Spas are “Ozone Ready” which means they have an suction ozone line that is already connected to the Spas plumbing and the ozone box connects to that. How the Ozonator works is very simple; the UV bulb creates OZONE and it is drawn into the Spa from the suction of the ozone line. Remember that you can’t see OZONE as it is a clear “active oxygen” but when it enter the water you typically see bubbles which is an indication that the Ozone is disinfecting the dirty molecules. Q. Why is OZONE so popular in Spas? A. 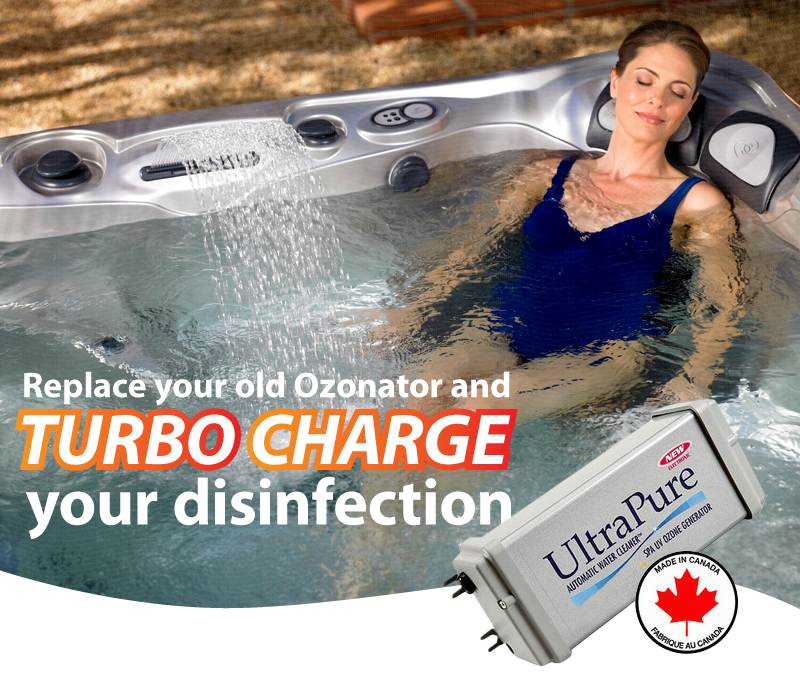 Hot tub manufacturers realized that installing ozone generators on their hot tubs would greatly reduce consumers’ stress when dealing with their hot tub water chemistry. They wanted to provide a powerful sanitizing component for their hot tubs as a first line of defense, protecting their consumers from viruses and bacteria, while making the water chemistry components much easier to deal with. Ozone does not leave contaminants in the water that smell, look or taste bad nor does ozone leave potentially hazardous by-products such as chloramines that can irritate your eyes, dry out your skin, fade swimwear, and damage pool and spa or water storage equipment. In fact, unused ozone reverts back to life-giving oxygen. Ozone KILLS. It’s organic, biodegradable, 100% natural, AND 3,000 times FASTER than chlorine at killing anti-microbials (which is a fancy word for viruses and bacteria). Q. Do I still need chlorine or bromine in my Spa? A. Ozone does not eliminate the need for small quantities of back up sanitation, but greatly reduces the need for bromine or chlorine down to 1 PPM. With ozone, you will notice that you reduce chlorine or bromine up to 60%, water will feel soft and silky and you won’t have problems with faded swimwear, red / irritated eyes, or dry skin. Reduced maintenance time and chemical usage will give you more time to enjoy your pool or spa. A nature fresh bottled-water swimming/bathing experience. Cost savings, fewer chemicals and less maintenance. Extended life of equipment and longer filter runs. Ozone is pH neutral. Adds no contaminants. Ozone leaves no unpleasant chemical taste or smell. Ozone will not irritate skin, nose, or ears, nor will it dry out or leave a chemical film on skin. If you have a spa that is five years or older, there’s a big chance the ozone generator has lived its useful life and is now in need of a replacement. Even if the UV bulb is lit the strength of the bulb has diminished over time. WE’LL BEAT ANY PRICE GUARANTEED! we will beat that price by 10% of the difference!